The Brotherhood Sports team that lost their big Division Three match at FC Peterborough: back row, left to right, (back) Kammy Khan, Michael Uff, Michael Sargent, Colin Harper, Gareth Jones, Ben Underwood, Stee Kidd, Scott Harrison, Jake Harrison, Chris Barnes, (front) John Danskin, Ryan Farrimond, Lee Taylor, Andy Yeomans, Michael Halfhide, Thomas Klinkovics, Daryn Whiteman. Thorney took pride of place in the Peterborough Premier Division on Saturday (November 19) as they registered their first win of the season. The villagers had lost all 12 of their previous top flight fixtures, and they had conceded another one, but they’ve seen some decent players return to the club in recent weeks. Action from FC Peterborough's 2-1 win over Brotherhood Sports. Photo: David Lowndes. And two of them, George Edwards and Reece Kenton, scored in a 2-1 win at Crowland. It wasn’t enough to get Thorney off the bottom of the table though. They are stuck on -2 points, 11 points adrift of next-to-bottom Leverington who maintained that gap with a 2-0 win over Holbeach United Reserves. At the top of the table Netherton United are three points clear after a hard-fought 3-0 win at Wisbech Town Reserves. Netherton manager Jon Harrison was thrilled by his side’s performance, especially as they stood up to a rugged physical challenge from the home side. Action from FC Peterborough 2, Brotherhood Sports 1 in Division Three of the Peterborough League. Photo: David Lowndes. “We hardly got out of own half for the first 20 minutes,” Harrison said. “There game plan was to go long and battle for pieces and they did it well, but the turning point for us was an incident which left 17 year-old Lewis Brisbourne distressed and struggling for breath. “The referee didn’t see what happened, but we did and from then on we really upped our game, matched their physicality and we dominated the rest of the game. Tom Randall opened the scoring with an exquisite goal on the half hour and second-half goals from Adam Scott and substitute Lee Clementson, with his first touch of the ball, followed. Reigning champions Moulton Harrox are second as Ben Allen and Ian Bradbury scored twice in a 5-0 romp against Uppingham, but keep an eye on Pinchbeck United who made it 12 wins in a row in all competitions with an 11-1 demolition of Stilton United. Ollie Maltby bagged a double-hat-trick to take his tally for the season to 26 goals in just 15 games. Pinchbeck, who last failed to win on August 23, are fourth, five points behind Netherton, but with two games in hand. Recent signing Alex Brockbank scored twice in Stamford Lions’ 3-3 draw at Deeping Rangers Reserves and improving Sawtry beat fading AFC Stanground Sports 3-1 in a match that unusually didn’t have an appointed referee. A member of the Sawtry coaching staff took control of a game that started late and finished in darkness. Langtoft United joined Pinchbeck in the fourth round of the Lincs Junior Trophy after an 8-7 penalty shoot out success against Lincoln-based Ruston Sports at Manor Way. It finished 2-2 after 90 minutes with Scott Spearink and Ashley Firth scoring for Langtoft who equalised in stoppage time. Langtoft now face a long trip to Scunthorpe-League side Barnetby United in the last 16. Pinchbeck will be at home to East Lincs Combination side Tetney Rovers in their fourth round tie on December 10. AFC Stanground Sports moved to the top of Peterborough League Division Two with a 3-0 win over Langtoft Reserves, while the big game in Division Three was won by leaders FC Peterborough, 2-1 over city rivals Brotherhood Sports. FC Peterborough, who are chasing a third straight promotion, are nine points clear of the rest. Crowland Town 1 (Ellis), Thorney 2 (Edwards, Kenton). Deeping Rangers Res 3, Stamford Lions 3 (Brockbank 2, Stanley). Leverington Sports 2 (Hurrell, Reed), Holbeach United Res 0. Sawtry 3 (Adams, Andre, Fisher), AFC Stanground Sports 1 (Rankin). Wisbech Town Res 0, Netherton United 3 (Randall, Scott, Clementson). 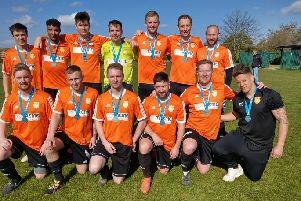 (Langtoft won 8-7 on penalties).